You don’t have to be fast. But you’d better be fearless. I love to run. I used to run 3-5 miles a day in college. I loved every minute of it, but I’ve never been very good at it. Fighting an arrhythmia, uncomfortable shoes, and a host of other things that make me tap out at 5 miles even in the best of shape – I’ve always longed to go much farther than my body allows. Post baby… way post baby… like, she’s old enough that being a mom is no longer any kind of relevant excuse to carry around the extra ten pounds I’ve had on me – I discovered that barefoot running is a thing. How convenient. I grew up in a Kung Fu studio, doing everything barefoot, as a child when running races I was always faster without shoes. Now, finally, someone told me I was allowed to do that. It was ok. After all, Ancient Olympians ran this way. Then, someone passed me this book. And I started LOVING running again. When you read this book, you can’t help but have a passion for movement while you do. You can’t help but move around. Read it on the treadmill, read it on the Gazelle, read it in the plank position, read it while stretching. You CAN’T read this and just lie in bed or cozy up on the couch. You just can’t. Instead, it inspires you. You want to go marathon in the woods. You want to register for every Color Run, Tough Mudder, and Spartan Races you can find. Arrhythmia and all, you actually debate sucking it up and running head first into an electric shock obstacle. This book makes you want to be the athlete goddess you used to aspire to… I mean, heck, I used to hold Kung Fu stances for three minutes a piece, run 5 miles, do 100 full body military style pushups, 300 crunches, 300 full sit ups, then go back for more. I have a black belt. A third degree black belt. I need to get back to that lifestyle. I lost 5 lbs. reading this book. No kidding. And it didn’t even hurt. 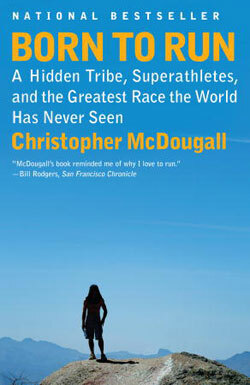 “The heroes of the past are untouchable, protected forever by the fortress door of time – unless some mysterious stranger magically turns up with a key.” – Born to Run, Christopher McDougall… I didn’t realize that one of my heroes of my past was just… me.